I am wandering the Texas State Capitol, that neoliberal shrine of business-attired beings clacking across granite and marble, of endless carved busts and oil paintings of white people, of AR-15-guarded doors by officers in brown uniforms. At last, in a circular room in the extension to the building, I happen upon a tall, silver, reflective box emblazoned with the demands “NO MORE PRISONS. NO MORE DEPORTATIONS.” It repeats across the shiny surface, and downward into the reflective polished granite floor it rests upon. I have arrived at the one-day art exhibition of drawings, photography, poetry, and prose by prisoners in Texas, about their experiences of incarceration, and their internal lives, their beliefs and hopes beyond those walls. The show was held in conjunction with Texas Advocates for Justice and Grassroots Leadership’s statewide #kNOwMORE2017 Advocacy Day on February 1st. It was a day of rallying, protesting, and lobbying to call attention to the violences of mass incarceration and deportation in Texas, and how that violence disproportionately targets Black and Brown communities. Through the advocacy day, these organizations pushed for policy changes which involve communities targeted by incarceration in policy development, reduce incarceration rates, stop construction of new prisons and detention centers, work with affected communities to begin closing existing prisons, prevent cooperation of local law enforcement with federal immigration officials and policies, and create fair chance hiring in Texas so that formerly incarcerated people will not be discriminated against for having a criminal record as they seek to gain employment. The art show came together through the collective efforts of Texas Advocates for Justice, Grassroots Leadership, and Inside Books Project, three community organizations which fight for support for imprisoned people and eventual prison abolition. The installation was created by Rebecca Sanchez, Beth Link, Holly Kirby, Jorge Renaud, and others with Texas Advocates for Justice, and Aems with Inside Books Project. Let me take you on a walk through the exhibit. Passing through the arched doorway, you see the silver box first, almost glowing, reflecting each person who walks by, involving and implicating them in its presence. You read its echoing message, all capitals, all black. To your right you see a series of square photographic portraits; they are mounted on wooden dowels which lift the portraits to eye level. You can walk among these, looking into people’s faces, and find on the back of each portrait a quotation from the individual depicted. You can walk among these signposts of individuality, of humanness. It takes you a while to read all the snippets of these people’s stories--they are all focused on an experience related to prison, or to the imprisonment of a loved one. A circle of iron around you. And then dared me to lift my voice. 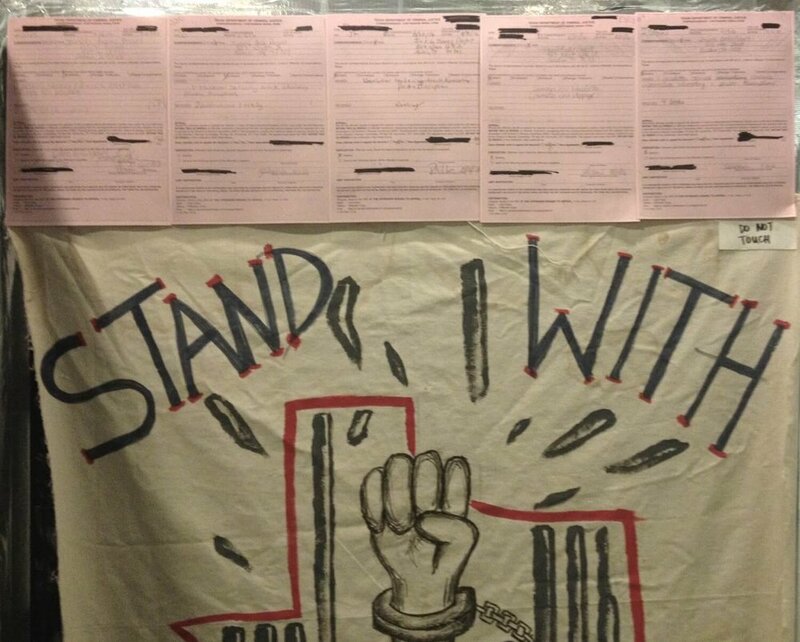 Censorship documents sent by Texas Department of Criminal Justice, rejecting newsletters and other reading materials for their content (with reasons listed such as “racial” and “encourages deviant sexual practices” and “info about work stoppages”) line the edges of a poster, contrasting with its text proclaiming “Stand with Striking Workers!” and image of the state of Texas, filled with a clenched fist bursting through metal bars. An eerie, dystopian installation calls you from another edge of the room, using the visuals of austere statehood. A semicircle of imposing banners, ranging in hues of reds and purples, hang from high posts, and join in the center in a knot which sits on a glass-topped table. Each banner bears the words “Criminalization of,” and each lists off one of the following facets of identity and experience: “Gender Rebels and Queer People,” “Mental Health,” “Poverty,” “Autonomy,” “Communities of Color,” “Education System,” “Migration.” The table before them houses a set of statistics depicted through white, handwritten text and painted wooden pegs. Finally, one fixture remains in the room to be reflected upon. An accordion fold of boards across the room presents tens of visual pieces--all drawings. Here the images are perhaps the most immersive in the show. Each is neatly matted, a small window through which the artist’s message peers. One large piece in graphite shows veined, strong hands cradling, covering, a face. Another piece in graphite memorializes the musician Prince, his face drawn in a sharp, delicate style, the tones transitioning carefully, hyper-smoothly; another by the same artist memorializes some of the queer Latinx people who were killed at Pulse nightclub in Orlando, their names written in curling, elegant script beside each carefully rendered face. In an ink and colored pencil piece, a brown woman in a tight red leotard and high boots sits, leaning forward, knees knocked, on the word “Pride.” A fascinatingly detailed trio of drawings in ink each depict a woman with a magnetic gaze, a shaved head, and a femme and vicious style replete with piercings, lace, and leather. In one drawing, the woman poses so that she is visible from head to hip, showing black lingerie, sharp black nails, a leather choker, and an intense expression. Around her float accessories (a bobbed wig with blunt bangs, a black, strappy heel), bottles of mysterious concoctions, and hormone pills (which, alongside the anti-binary gender sign tattoo visible around her navel, project a proud trans or genderqueer identity), and patches of zigzagging, energetic light. Another shows two women from the shoulders up, pressed close to one another. The same woman from the previous piece is seen on the right, her gaze again intent, though she looks slightly to the side of the viewer this time, her sharply defined brows and sweeping eyeliner framing the sideward glance. The second woman, with a flip of short light-colored hair, also with smokey, sharp makeup and facial rings, gazes out with her hand gently touching her throat, a syringe delicately perched between her fingers. Cracking, wavering bars can be seen beside them to one side, while elegant spider webs stretch across other corners. A yonic, dark rose with leaves and tendrils blooms on the bottom right, surrounded by a grouping of pills, patterns, and ink. A spoon pours a dark liquid into a small perfume flask labeled “LGBTQ IBP.” The third piece shows the same woman leaning back, wearing a mesh shirt which shows her abdomen, breasts, and collar bones, as her gaze interlocks with the viewer’s. She grasps a book in her elegant-nailed hand entitled “Knowledge Empower People,” with the subheading “Thank you Inside Books Project. Happy Valentines Day.” Other books float around her body in a dark space, reading “U.S.A. Federal Law,” “How to Educate Yourself,” “How to Deal with Incarceration and Help Your Self,” “Be a Well Read Person,” “U.S.A. Constitution: Learn Your Rights,” and finally, one emblazoned with an anti-binary gender symbol, a feather, and an ink pot. Returning to the central box just before leaving, I felt the silver fabric of its walls repeatedly wobble around me from the speeding steps of aides and elected officials walking dangerously close to the display. Obliviously close? Angrily close? I wondered, what are they thinking?